The team at Title Nine has many players — and many coaches. Our own athletic and personal lives have been shaped and influenced by coaches we’ve had, making the decision to embark on the same path an important one. We look up to those who lead the way for us: it’s time for us to lead the way for the next generation. 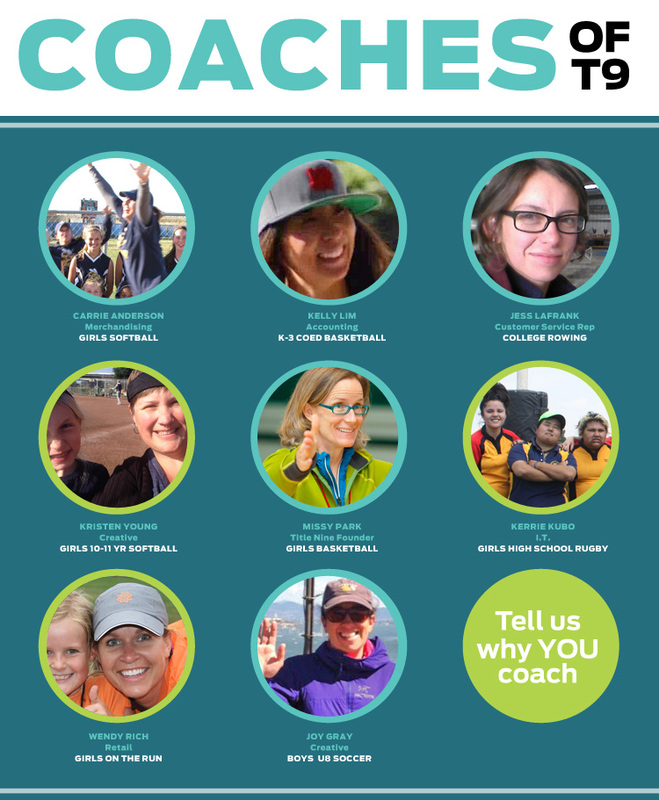 Do YOU coach? Tell us why below. If you were in the T9 catalog, what would your caption be? Share with us! As part of our Starting Block program here at Title Nine, the Bra Brigade functions to provide sports bras to girls who haven’t had the opportunity to experience solid, comfortable support. We’ve connected with everyone from a local high school running club to breast cancer survivors training for a triathlon. In this particular case we worked with the parents and coaches for the Ho’opa girls volleyball team in Hawaii to get them fitted for their new bras. The girls then went on to compete in nationals on the mainland! If you or anyone you know is working with a group of at-risk girls who are in need of some “support”, send them our way! Drop us a line at startingblock@titlenine.com and we’ll be happy to see what we can do for you! The girls in their courtside seats on the sidelines. We love it when our stores have the opportunity to get out into the community and share some Title Nine feel-good vibes. This last week our girls from the Title Nine Evanston and Lincoln Park stores were able to make some dreams come true by sponsoring 81 athletes from Girls on the Run, Girls Rock and Girls in the Game to attend a Chicago Sky WNBA game. Between giving away goodie bags and seeing Olympic Gold Medalists, they made one heck of a night out of it! Before the game the girls were able to watch the Chicago Sky team warm up which also meant they got sneak peeks of Olympic Gold Medalists up-close and personal! Too cool for them to see their idols so close! And too cool for our girls to be there and share it with them! The team also happened to be celebrating the 40th Anniversary of Title IX that night and were giving away free t-shirts and sporting warm-up jerseys in honor of the legislative bill. It was just meant to be for the crew to be there! Of course, it wouldn’t be a great Title Nine event if we didn’t bring along some goodies to give away to our biggest fans! So the stores brought plenty of T9 goodies and hosted a raffle to give away the surprises in the second half. Two lucky ladies went away with T9 Tee’s, Smartwool Socks, and water bottles while the final Grand Prize winner scored a $250 gift card! Loving her new bag of goodies! It was so wonderful to see so many Mom’s and daughters out for the game, excited to be there and having a little bit of fun. 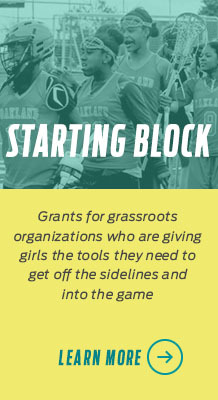 Being able to provide Girls on the Run, Girls Rock and Girls in the Game with a great experience was definitely rewarding because they are three organizations that speak directly to something we hold very highly around around here – getting at-risk girls off the sidelines and onto the field. Or in Girls Rock’s case, behind a microphone! Many thanks and high-fives to those who are working to keep those organizations a success. If you’d like to learn more about Girls on the Run click here; Girls Rock, here: and Girls in the Game, here.